A high energy class, completely low-impact, with a variety of music. Workout is adaptable to a range of fitness levels (from beginner to very fit) and ages. Upper, lower, and mid-body strengthening/toning using a variety of exercise equipment (all provided). Mondays, Wednesdays, Fridays: 9:15 – 10:15 a.m.
Instructor: Cindy Egeland – AFAA certified, 30 years of experience; training specialty in exercise safety. Thursdays in June: 7:00 – 8:00 a.m.
Thursdays in July and August: 7:30 – 8:30 a.m.
Never boring and suitable for beginner to advanced exercisers, this class incorporates a fusion of exercise styles with focus on both aerobic and strength elements. Expect various types of high and low-impact cardiovascular exercise including aerobics, dance, boot camp, and cardio kickboxing. In addition, strength training with weights, yoga, and/or Pilates will be incorporated into the exercise sessions. Wear fitness shoes, and bring a mat and water bottle. Weights are provided. Mondays, Wednesdays, and Fridays: 8:00 – 9:00 a.m.
Instructor: Pam Hart – holistic health coach and nationally certified in group fitness and weight training for women; more than 25 years teaching experience. CPR certified. Mondays: 7:00 – 8:00 p.m. This 30 minute “all cardio” aerobics class will get your heart rate up and burn fat. This is a high energy workout which combines both high and low intensity movements. Looking for a great combination workout? Take Total Body Sculpt immediately following this class. You will have the option to register for Total Body Sculpt when registering for Quick Cardio. Click here to register for any of the above days. Zumba is a fusion of Latin and international music – dance themes that create a dynamic, exciting, effective fitness system! Zumba combines high energy and motivating music with unique moves and combinations that allow the Zumba participants to dance away their worries. Zumba is fun and easy to do. Two left feet, no problem. Just move to the music. Classes include Zumba Toning, bring lightweight toning sticks or dumbbells. Dance/fitness sneakers or sneakers with a worn tread are recommended but not required. Bring a water bottle and small towel. *Note: You will be given the opportunity to register for Zumba Toning when you register for Zumba. To opt out, just select 'next' on that screen. Tuesdays and Thursdays: 9:00 – 10:00 a.m.
Instructor: Debbie Colditz – licensed Zumba instructor since April 2007, AFAA and CPR certified. Studied dance for 17 years and fitness for more than 20 years. Zumba Toning takes the original Zumba fitness class to the next level with the addition of lightweight toning sticks or dumbbells. Created to emphasize muscle work along with rhythms, this combination of cardio and dynamic resistive exercise is an effective use of progressive lightweight training to improve overall performance. Zumba Toning is fun, different, challenging, and effective. This class is not recommended for anyone with neck or shoulder pain/injuries. Prerequisite: Must be in or have taken WROC Zumba to register for Toning. No walk-ins, no make-up classes. Thursdays: 8:30 – 9:00 a.m.
$75 Register for Zumba Toning when you register for Zumba. $35 Register for Zumba Toning when you register for Zumba. All players must be a least 18 years old and complete a registration form. Drop in anytime! Mondays and Thursdays: 8:10 – 10:00 p.m.
Tuesdays: 8:10 – 10:00 p.m.
As the weather gets nicer; it’s time to enjoy the world from two wheels! If you are interested in doing a weekly road bike group ride, where no one gets dropped or left behind, sign up today! We’ll meet at the Tandem Connection each week for a ride on the trails, free of cars! Don’t have a bike, no problem … rent what at the Tandem Connection. Wednesdays: 7:00 – 9:00 p.m. Location: Tandem Connection - right on the trail! All players must register and be at least 18 years old. 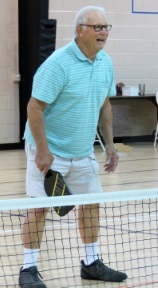 Pickleball is designed as a fun, social, and easy to learn activity! Combining the elements of tennis, badminton, and ping pong, pickleball uses paddles, a small wiffle ball, a net, and a court. Equipment provided. Thursdays OR Fridays: 6:00 – 8:00 p.m.
Register for Pickleball waiting list. The arthritis exercise program is a fun-filled, low-impact course that helps most people with arthritis increase their joint flexibility and find relief from arthritis pain. The program features gentle, joint-safe movements and can be adapted for various fitness levels. This low-impact, fun class can be taken either sitting or standing. Mondays: 9:30 – 10:20 a.m.
Pay per class is not available for this class. This fun, energetic workout fuses classical ballet and Pilates that will strengthen and tone your lower body and core. Class includes 30 minutes of barre work followed by 30 minutes of mat work. No experience necessary! Thursdays: 6:00 – 7:00 p.m.
Ohio Health Delay the Disease™ is a fitness program designed to empower people with Parkinson’s disease (PD) by targeting their symptoms and optimizing their physical function. This Parkinson's specific fitness program is designed to proactively minimize tremors and improve flexibility, stability, balance, and strength. Classes include exercises to improve activities of daily living, like getting out of bed, getting off the floor, getting out of the car, getting out of the chair, dressing, freezing, posture, rigidity, moving about in crowds, and lots more. Read more about Parkinson's support at Westminster in The Almanac. Spring into action with the Pole Walking Workout at the WROC! The classes are taught in four one-hour sessions that include conditioning exercises, walking drills, pole technique, and outdoor adventure and cool down stretch. The instructor will adjust the poles to each student’s height and body type on the first day of class. Instruction is easy and fun, and filled with music and laughter, as we all learn to embrace the Nordic exercise phenomenon of pole walking. Imagine transforming a causal walk into a gentle, fabulous, fun filled, whole body workout that engages 90% of your major muscle groups! Pole Walking is one of the easiest forms of exercise most of us can do, from the casual, average walker to the serious, athletic walker. 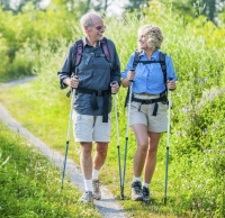 Using poles while walking increases calorie burn and cardio health, while lessening the impact on joints. Have fun – be happier! Students must purchase their own poles and have them available for the first day of class. To learn more about Pole Walking and pole pricing, visit www.keenfit.com. Poles are also available at a variety of price ranges at local stores. Please join instructor Anne Brucker, M.Ed., as she shares her 40 years of fitness skills to bring you a delightful new experience in a walking workout. 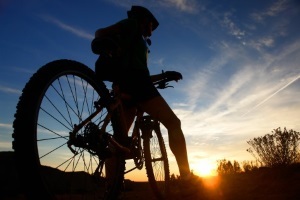 Exercise plays a critical role in building and maintaining bone strength. Exercise Physiologist, Anne Brucker, presents a gentle, joint friendly OsteoDynamic program that strengthens the spine, rebuilds bone, teaches balance and reduces fractures. Participants may choose to stand or sit. Please bring a pair of light hand weights (2 to 3 lbs.) to class. Wednesdays, 9:00 – 9:50 a.m.
* Anne Brucker has worked for 40 years as a teacher, lecturer and researcher in the health industry. She served as the lead exercise physiologist for the six years at Highmark Osteoporosis HOPE study. Ms Brucker acted as the Exercise Design Coordinator and conducted the pilot program for the University of Pittsburgh’s 10 Keys to Healthy Living study and currently serves on the advisory board for the MOVE UP study at the University of Pittsburgh’s Prevention Research Center. Energize your muscles, refresh your spirit, increase your blood flow, stimulate your mind, and regain youthful balance and agility through the gentle flowing motion of Tai Chi. This ancient Sun Style form is performed in a wavelike rhythm that brings harmony to breath and gentle movement. It is safe and soothing for fatigued muscles or arthritic joints. No special clothing required. Instructor: Anne Brucker – M.Ed. in Exercise Design and 10 years of martial arts experience. This class is designed to shape and tone the body using body bars, dumb bells, bands, tubes, and loops (all provided). A systematic approach for strength and flexibility in the major upper, mid, and lower body muscle groups. Looking for a great combination workout? Take Quick Cardio immediately before this class. You will have the option to register for Quick Cardio when registering for Total Body Sculpt. Rebecca's class focuses on body awareness while stretching, breathing, building balance and strength, and increasing flexibility using a smooth flow format. Prayer and scripture will be incorporated to help build and support the spirit, mind and body. Class is suitable for beginner through intermediate. Yoga positions will be described and modified for those new to yoga. Students should be able to get up and down off the floor with ease. Please bring a mat to class. Tuesday and Friday: 9:30 – 10:30 a.m.
Tuesday and Thursday: 9:30 – 10:30 a.m.
Class will meet in Room 194 on 5/16. Instructor: Rebecca Paul – Certified AFAA group fitness instructor through YogaFit; CPR certified. Great training for student athletes! Share the benefits of Yoga with your child! Yoga helps with stress and weight management, balance and flexibility. Pre-teens and teens, as well as student athletes, can share in these same benefits along with adults and gain essential life tools such as self-esteem and confidence, inner and outer strength, attention and concentration, and heightened awareness of both oneself and others. Class focuses on body awareness while stretching, breathing, building balance and strength using a smooth flow format. This class is appropriate for all fitness levels and individuals or parents with a child. Please bring a mat to class. Tuesdays: 6:45 – 7:45 p.m.
Children ages 14 and older are welcome to attend; participants under the age of 16 must be accompanied by an adult. Class will meet in Room 194 on 4/23 and 4/30. This yoga class emphasizes a gentle form of the classical hatha yoga poses and slow-moving yoga postures. It is non-competitive, fun and appropriate for people of all sizes, fitness levels, and ages. You don’t have to be a contortionist or even be able to touch your toes to perform the yoga exercises and poses! This gentler, slower-paced yoga program will improve your flexibility, will increase your strength and vitality, will reduce tension, and enhance inner calmness to bring health, enjoyment, and well-being into your life. Classes allow students to progress at his or her own pace. Both men and women are welcome. There are no age limitations. Wednesdays: 10:00 – 11:00 a.m.
Instructor: Larkey Miller – Board certified by the Himalayan Institute; CPR certified. Mondays: 5:45 – 6:45 p.m.
Class will meet in Room 194 on 4/8 and 5/13.